Free Shipping Included! Pansonite Premium 3D VR Glasses with Adjustable Lenses & Head Strap, More Lightweight and Comfortable Virtual Reality headset for 3D Movies and Games, Fit for iPhone and Android Smartphone (black) by Pansonite at Kode Fu Guru. MPN: 6097777630954. Hurry! Limited time offer. Offer valid only while supplies last. Pansonite 3D VR Glasses, the best gift for kids and friends! We all know that once you are actively using a VR Headset, you always want it with you. Pansonite 3D VR Glasses, the best gift for kids and friends! We all know that once you are actively using a VR Headset, you always want it with you. Pansonite 3D VR is no more clunky and more convenient to carry. New social features to interact with friends in VR -watch a movie/TV together, play a game or just chat in a virtual world experience. To have comfortable wearing and high quality 3D photos, it adopts ABS + non-woven, adjustable nylon headband and 40mm aspheric optical resin lens. The front cover is magnetically attached and keep your device cool. You could adjust the head strap according to personal wearing size to get the best experience. Press the multifunctional button will contact screen, making you convenient to enjoy the 3d world. Lenses are ungraded to be more smooth and purified to protect your eyes . Improved soft artificial perforated leather around the eye area and headband to keeps you feeling good even after hours watching. Panoramic view and high quality 3D photos bring you an unlimited world. Turn your smartphone into a virtual reality viewer, experience the immersive, fun and exciting world of VR. Enjoy 360 degree panoramic videos and photos, watch 3D IMAX movies in your private theatre, connect your smartphone to your PC and completely immerse yourself in your favorite video game world! Pansonite 3D VR Glasses feature its innovative fabric design, light weight and comfortable wearing, which contribute to immersive visual experience with high definition photos. Go anywhere, do anything, be anyone with virtual reality. 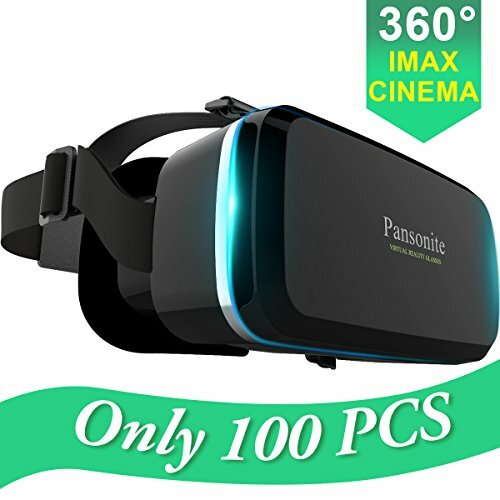 ★Compatible for All THE SMARTPHONES- Suitable for every 4.7-6.0 inch smartphones no matter iPhone or Andriod, you can use the Pansonite VR to watch Left-right 3D movies on Video Player and play varieties of VR games. Such as iPhone 7 7 plus 6 6 plus 6s 5s 5c 5 Samsung Galaxy s5 s6 s7 s8 note 4 note 5 edge Google Pixel.You are in for a high-end quality 3D experience! If any questions, please be free to contact us, we will resolve your problems as soon as possible within 24 hours.